We all know we love our children, and most of us probably tell them repeatedly too. But, how often do we go the extra mile, and really show them love. As adults we know that we show love by going to work every day, or making sure they have a roof over their heads, or food on the table, but children tend to expect those things, so don’t necessarily see them as expressions of our devotion to them. 1. Get down on my knees to listen to them. Not all the time, not with everything they say – heaven knows I’d spend my life on my knees, my three year old is so chatty – but when she’s trying to tell me something important to her, I like to go down on my knees, look in her eyes, sometimes holding her hands, and asking her to repeat what she wanted to tell me. I specifically do that when she has clearly been trying to tell me something and has become frustrated because I wasn’t listening attentively enough. 2. Touch and kiss them often. I never shy away from an opportunity to touch my children. If it means crossing a room a little to the left of the door I’m heading towards or popping in to the room they are sitting in on the way past it to tussle their hair, squeeze a shoulder or give a cuddle, I always make an effort to touch and cuddle my children. We take lots of photos of baby’s firsts: first steps, first haircut, first meal. My daughter went to her first ever lunch club last week, and I had to make her her first ever ‘packed lunch’ for what she thinks of as school. She was so excited about it, she wanted me to take a photo of her first ever lunch box. A few days later she very excitedly told me that she had put her own hair clip in her hair on her own for the first time ever. I realised that even though she’s happy to be the big girl now, she’s still a baby in so many ways, and her firsts still need to be celebrated. I’ve never been excited about a skewed, upside down hair clip in all my life, but boy, was she delighted. 4. Spend private time with each child. Easier said than done with multiple kids, right? But actually, it can be done! My baby sleeps later than my toddler in the mornings, so after she’s nursed for a while, we ‘hide out’ under the blankets in bed, cuddling together, whispering to each other so as not to wake our little sister up. She also naps in the afternoons, so that’s often an ideal time for my toddler and I to do crafts together, or something ‘big girl’, that’s not suited to babies. My daughter relishes these times. Can we play outside? No. Can I blow bubbles? No. Can I… No, Can I… Maybe later, Can I… Not today. If that resembles your conversations, it’s time to start saying YES! Often we say no more out of habit than reason, and sometimes our reasons are pretty lame! I’ve been trying to say yes more often, and saving my no’s for when I really mean them. My daughter loves asking me to get up and dance with her to advertising jingles in between TV programs. It’s such a pain, but when I do jump up and wiggle around with her, she delights in it and it wasn’t really that hard for me to do! 6. Talk about your children in front of them. How often don’t we say to friends, ‘we’ve had such a tough week. She just wont listen. She’s so disobedient! I could just kill her today!’ Almost everyone is guilty of thinking our children don’t understand, aren’t listening, or are too young to break our codes. Sadly, they absorb so much more than we think they do, so let them overhear you saying positive things about them, rather than negative. Don’t talk about them in the third person in front of them, unless it’s to tell someone else how proud you are of your little people, how much you love them, and grateful you are to be their mama. 7. Write letters to your children. The first letter I wrote to my daughter was the day I found out I was pregnant with her. I wrote to her during my pregnancy and whilst in labour. I also wrote a letter every month. My baby was about the same, and I still try to write to them each month. It may not matter right now, and they wouldn’t ‘get’ what I was saying even if I did read it to them, but I imagine a beautiful bound book filled with the message of my love, my adoration of them, from the moment I knew about them given to them on their 18th birthdays. 8. Do something they really want, as a surprise. I had bought a gingerbread man cake mould weeks before, and my daughter kept asking me if we could make some. I really don’t like gingerbread, so I kept saying no. One afternoon as she was playing in her playroom it dawned on me that they didn’t have to be gingerbread, so I whipped up some ultra good for you brown flour and rapadura carrot cakes. After dinner when I brought out her ‘gingerbread man’ she was so excited! She ran around to me to thank me, and again after dinner, and again before bed. If I’d known how much she really wanted a gingerbread (carrot) man, I’d have made it weeks before. 9. Fight for your children, defend them. 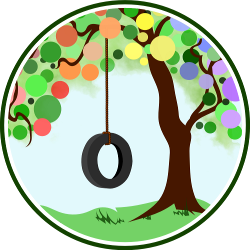 Being derogatory towards children is normal in our society, and treating them in a way you wouldn’t be likely to treat another adult is pretty common place. View your children as having the same rights as your friends, colleagues and contemporaries, and you’ll be ready to stand up for them when they need it. Like a mama tiger, protecting her cubs. 10. Have a special place for art work masterpieces. No matter how small, how frequent or if it’s just a squiggle on a paper, when your child presents their art to you, love it. Love what they’ve done. I’m not talking about fake praise here, and you can use your encouraging words, but when their art is finished, have a special place. A fridge magnet to hold the art on the fridge is a good idea, but we took a shallow box, a vegetable delivery box, painted it black for a frame, and put it in our living area. Every picture is named and dated and goes in the box,, on display, till the next one takes its place. They took the time to make it for you, with love, to present it to you, with pride, and they deserve to have it displayed with your love and your pride. 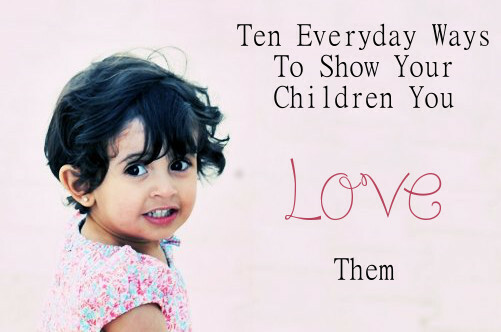 What do you do to show your child you love them? What haven’t you done but think you should implement?